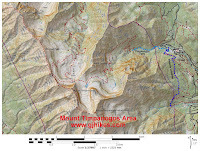 The Stewart's Cascades trail is located in the Uinta National Forest near Sundance, Utah. To most people the trail is probably more familiarly known as the Stewart Falls trail. This trail has a lot of ups and downs so the seemingly 349 feet of elevation change is actually over 1500 feet when all is said and done. That will vary depending on whether you hike down to the base of the falls, where the elevation is several feet lower than the trailhead, or whether you hike up closer to the top of the falls. The trail begins at the west end of the Aspen Grove parking area near the restroom. Parking runs out quickly at Aspen Grove. There is some overflow parking along the Alpine Loop Road but to avoid an expensive tow be sure not to park illegally. The entrance fee is charged for every vehicle driving on the Aspen Scenic Loop whether you plan on hiking or not. 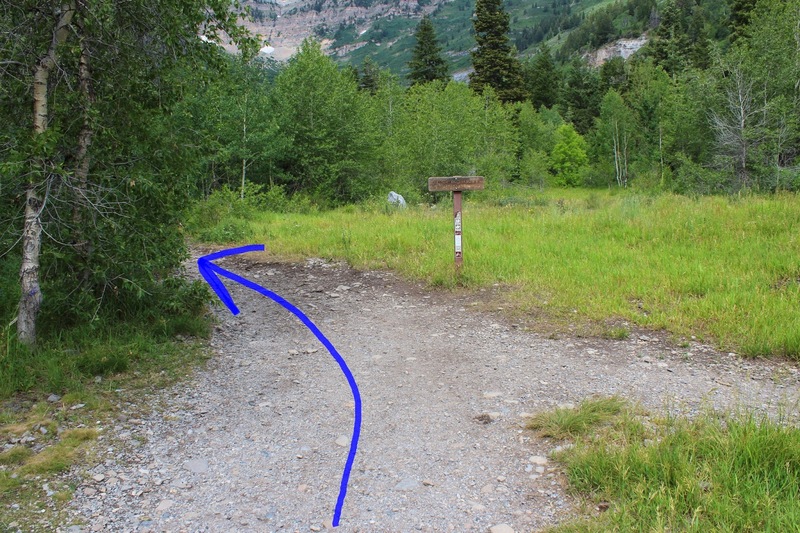 The fee station for the south entrance is located right after the Sundance Resort and just before the Aspen Grove trailhead. Within a hundred yards or so the Stewart's Cascades trail forks off to the left. The trail begins climbing around the side of the mountain quickly gaining elevation as it travels above the campground. The enjoyment experienced from just being out in nature seems to make any hike feel easier. After about a mile and a half of hiking the trail breaks out of the trees on a meadowed ridge at one of the highest points of the trail. From here the grassy ski slopes of Robert Redford's Sundance Resort come into view. Robert Redford purchased the land in 1968. The original owner of the land was S. Paul Stewart for whom we are assuming this trail and waterfall were named after. The last of the trail as it continues around the mountain descends toward the falls. At an overlook near the falls hikers have the option of descending to the base of the falls near the creek or trying to climb up higher to the base of the first cascade. The creek area below the falls is actually a few feet lower that the trailhead. This photo was taken on a Saturday and as you can see there are numerous people both above and below the lower cascade. For us it wasn't any less enjoyable with a crowd like this. 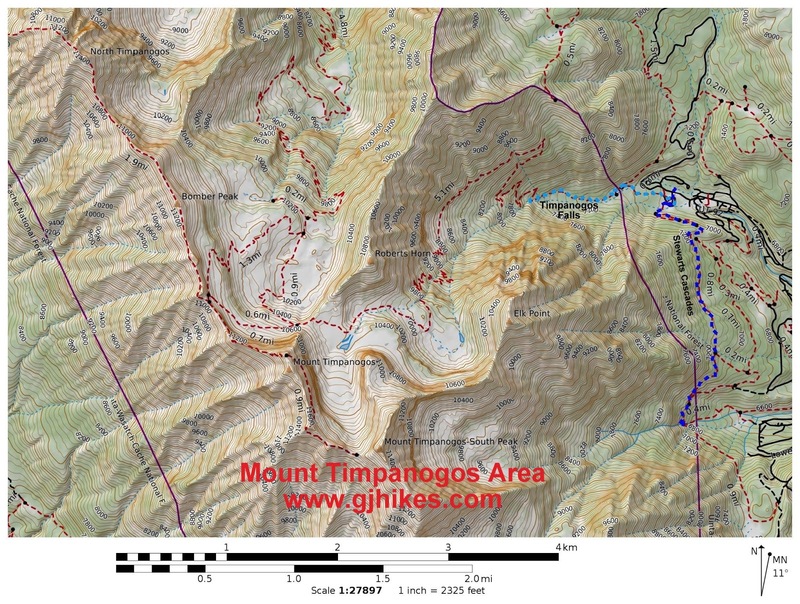 The upper trail should probably be left to the more experienced and nimble hikers. The amount of water coming down the falls will vary as the snow fields of Mt. Timpanogos disappear from above. We submitted this photo to Butterflies of North America for identification, after spending several hours looking unsuccessfully through many images on several websites, and found out that it is the gnopheala vermiculata moth. It is commonly known as the police-car or green lattice moth. The Stewart's Cascades/Stewart Falls hike is very popular on weekends and holidays. This hike just happened to be a holiday weekend. Many of the groups of hikers were families with small children. For that reason be sure to keep your pet on a leash and under control at all times. The Wasatch Range spawns many waterfalls and several of them are easy to access. Timpanogos Falls is only a 2 mile round trip hike and it also leaves from the Aspen Grove trailhead. The picturesque Bridal Veil Falls is located nearby in Provo Canyon. If you would like to see them for yourself then all you have to do is 'Take a hike'.